Chad Smith and Will Ferrell, or Will Smith and Chad Ferrell. When it comes to celebrity look-alikes, there are close companions, and then there is Will Ferrell and drummer Chad Smith from the Red Hot Chili Peppers. They look almost exactly alike, and that similarity has not been ignored by either man. Specifically, Will Ferrell has appeared on late night talk shows discussing, among other things, his drummer look-alike. 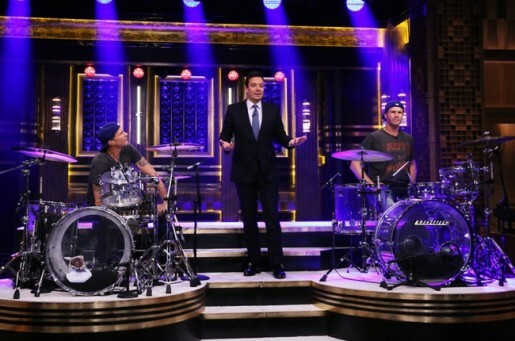 Eventually, Ferrell challenged Chad Smith to a drumming contest, and eventually, the professional musician took him up on the offer, with the venue of choice being The Tonight Show. Will Ferrell and Chad Smith of the Red Hot Chili Peppers had a drum battle last night on The Tonight Show With Jimmy Fallon. The winner, as always, is all of us. Here’s the video of the drum battle, which ends up in a group jam involving Chad Smith, the rest of the Chili Peppers, and Will Ferrell on cowbell. Of course Chad Smith is a good drummer, since that’s been his only job for decades as a chili pepper enthusiast, but I’m really impressed by Will Ferrell. He’s actually not a bad drummer. I mean, he’s no pro, but he’s at least marginally competent. Perhaps he’s been taking drum lessons to get ready for his bit? Either way, it ends with a rousing version of “Don’t Fear The Reaper,” and so everyone’s happy with more cowbell.